More than 28 days is a hashtag that caught my attention on Google+ during the month of February. The poster, Kymberlyn Reed, took a unique approach to Black History Month. Instead of using the #blackhistorymonth tag, she used her tag to hammer home the fact that Black History Month should certainly be “observed” longer than twenty eight days. Ms. Reed has the right idea. While Black History Month,(just like Women’s History Month, Hispanic Heritage Month and other months/observances I’m sure I’m missing), serves to highlight some the achievements of Black people, it shouldn’t stand out like a sore thumb. Black people helped build the United States, and often their achievements were either swept under the rug or stolen by whites. When I had a classroom of eager to learn fourth and fifth graders, I certainly didn’t wait until February to tell them about what is basically the history of the United States. In addition, I made a distinct effort not go for the “easy” ones – Dr. King, Harriet Tubman and good old Garret Morgan and his traffic light. Even if the history books don’t fully acknowledge it, Black people were and still are an integral part of our heritage here in the U.S. Without them, there would be no dustpans, ironing boards, printing presses, typewriters, automatic elevator doors, mops, clothes dryers, pencil sharpeners or gasp! fountain pens!! Not to mention, the various colleges and universities dotting our great country. People ask – Why is there a Black History Month? Well, there shouldn’t be. However, if the contributions of all Americans were acknowledged fairly in American history books, there wouldn’t HAVE to be a Black History Month. So if you’re on Google+, or even if you’re not, stop by and check out the #morethan28days tag. You might learn something. I know I did. I had not heard of Emmett Chappelle until my oldest son did a paper on him in fourth grade. This brief blurb does nothing to highlight the numerous contributions that Mr Chappelle has made to the area of science. I pass this brief biography on so that you too may discover this “under the radar” brilliant scientist who was born on a farm in Arizona. 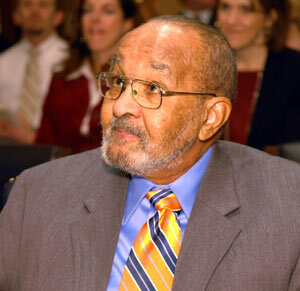 Born on October 25, 1925 on a farm in Arizona, Emmett Chappelle was determined not to be shaped by his environment. The farm did not have electricity until he was twelve years old and he attended a one-room school. After graduated from the Phoenix Union Colored High School in 1942, he was drafted into the US Army. He was assigned to the Army Specialized Training Program, where he was able to take some engineering courses. Later, he was reassigned to the all-Black 92nd Infantry Division and served in Italy, where he was wounded in action. After leaving the Army and returning to the United States, he received a Bachelor of Science in 1950 from the University of California and a Master of Science from the University of Washington in 1954. From 1950-1953 Mr. Chappelle was appointed an Instructor in Biochemistry at the Meharry Medical College. Between 1955 and 1958 Chappelle served as a Research Associate at Stanford University; later, Emmett Chappelle was appointed Scientist and Biochemist for the Research Institute of Advanced Studies at Stanford University, from 1958-1963. Between 1963 and 1966 he worked as a Biochemist for Hazelton Laboratories, then as Exobiologist (1966-1970) and Astrochemist (1970-1973). Chappelle served as a Biochemist for the division of Research Center for Space Exploration. 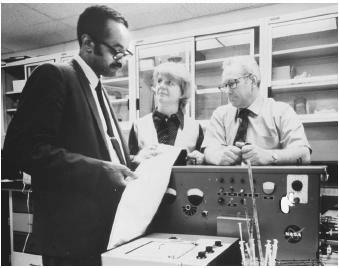 Beginning in 1977, Emmett Chappelle began working with Goddard Space Flight Center as a Remote Sensing Scientist. He has received fourteen US Patents and been involved with over one hundred conference papers, peer-reviewed scientific and/or technical publications. He has also been honored as one of the top 100 Black Scientists and Engineers of the 20th century. He was inducted into the National Inventors Hall of Fame in 2007 and now lives in Baltimore with his family.